Welcome to the Official website of Redwood Lodge No. 35, Ancient Free and Accepted Masons. Incorporated in 1878, we are located at the beautiful Masonic Temple in the center of East Providence, Rhode Island. Freemasonry, through the practice of the character qualities learned through our Ancient rituals, cultivates a brotherhood among men of different backgrounds and beliefs which is truly unparalleled. Our Masonic brothers here at Redwood Lodge are united under these teachings and principles, which in turn develops a common bond and leads to a more enriched life. 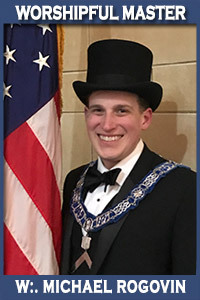 Masonry has, for hundreds of years, provided a guide for men of all walks of life to develop their character, create lifelong friendships and find a way to give back to their community through the charitable activities of selfless service to others. For many men, becoming a Freemason at Redwood Lodge has been one of the best decisions they ever made. Redwood has had as members many of the finest civic and Masonic leaders in Rhode Island. At Redwood Lodge, through the practice of Freemasonry, we attempt to instill the common goal of all Masons to become better men in both our personal and professional lives. If you are considering becoming a Freemason, I hope that you will take time to explore our website to learn more about Redwood. If you are a Mason already, I hope that you will include a visit to Redwood in your travels through the Rhode Island Masonic jurisdiction, where you will always find friendship and Masonic brotherhood. Thank you for your interest in Redwood Lodge No. 35.